At May’s commencement ceremonies, Columbia College Chicago will graduate more than 2,400 students, one of the largest contingents ever. These grads will join the tens of thousands of distinguished Columbia alumni who are creating, making and doing throughout the Midwest, the U.S. and beyond. With new leadership under Dr. Kwang-Wu Kim, the college and the Office of Alumni Relations are ramping up efforts to better serve our incredible expanding cadre of alums. We want to develop strong, lasting ties with you, and the upcoming hire of a new national alumni director will take us further in the right direction. In the coming months, look out for more professional services—webinars, workshops, symposia—to help you as you pursue your career. We will develop a set of programs that supports all levels of alumni. In addition, we will create more opportunities to get involved in mentoring current students on campus. Consider getting more involved with alumni where you live. Contact your local CAAN chapter leader (see “CAAN Updates”) to learn how you can help fellow alums and yourself. Please stay in touch with us. 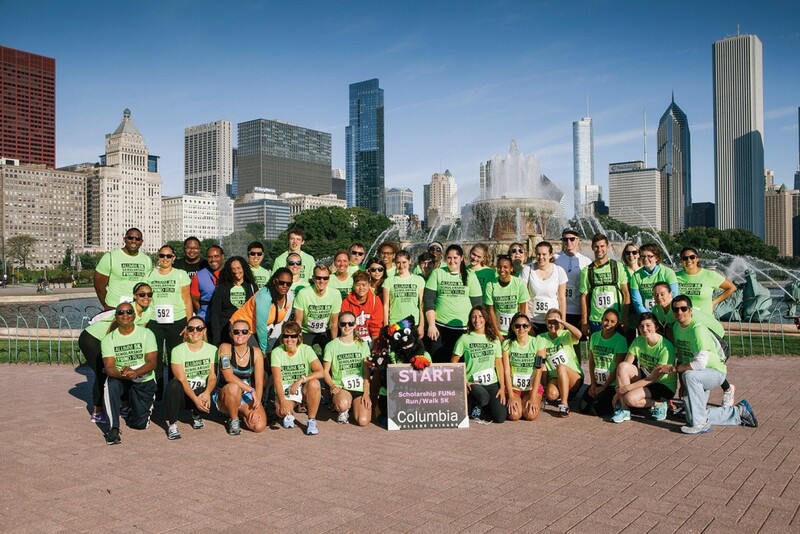 Follow us on Facebook, join the Columbia College Chicago Alumni group on LinkedIn and send us a class note. We want to hear about your challenges and accomplishments. What are you doing out there? We want to know! 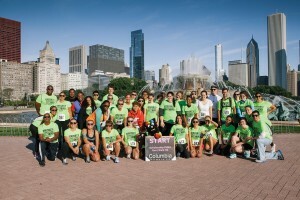 To submit your news, go to colum.edu/alumni, click on “Promote Yourself,” and submit a class note. If you’ve never logged in before, you’ll need to complete a quick registration first. Class news information will be printed based on availability of space. Announcements that are incomplete or older than one year cannot be considered for publication. 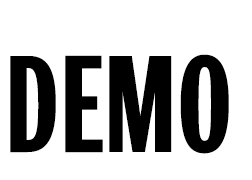 Deadline for the Fall/Winter 2014 issue is Aug. 1. After raising $7,000 on crowdfunding site Kickstarter, Maximilian Timm (BA ’02), 35, published his fantasy novel, The WishKeeper, in November 2013. The story revolves around Shea, a tattooed, punk fairy with broken wings who’s determined to make a human’s wishes come true despite her handicap. You came to Columbia to study film. How did your film background influence your writing? My film background helped me understand (and practice) how visuals can tell a story. The WishKeeper started as a script—many, many, many drafts of a script. I worked on it for eight years before trying to write the novel. All of the books I am working on now start as screenplays, so you could say my film background had a very direct impact on my novel writing. 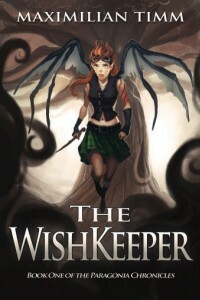 How did you get the idea for The WishKeeper? My sister and I wanted to adapt an old PC game called King’s Quest. That project fell flat, but it gave us the motivation to start from scratch and tell our own story. The first five or six drafts had nothing to do with fairies or wishes, but the more I focused on what was truly unique about the story, this little broken-winged fairy kept popping up. Shea was born out of hours of brainstorming that focused on creating a character no one had seen before: a resentful, pissed off, handicapped teenager who just so happened to be a fairy with broken wings. Hank Grover (BA ’79) produced the documentary film The Power of Photography: Beyond the Image, about several renowned National Geographic photographers. Grover also produced Provocateur, a documentary about photographer Helmut Newton, featuring producer Robert Evans and actress Darryl Hannah. Margaret Jamison (BA ’73) was named by Black Press Radio as second among 14 Women to Watch in 2014. She is the publicist to D. Channsin Berry, director/producer of 2014 NAACP Image Award nominee Dark Girls. Nancy Stone (BA ’79) is the executive producer of the film Words and Pictures, starring Clive Owen and Juliette Binoche. The film premiered at the Toronto Film Festival and was picked up for U.S. distribution by Roadside Attractions. Patricia Blum (BA ’84) was promoted to vice president of the American Growth Fund. She is the Columbia Alumni association & Network (CAAN) chapter leader for Denver as well as the Southwest regional representative on the CAAN National Board. Jens Bogehegn (BA ’88), one of the founders of Zacuto camera accessories, was a producer of the documentary Light & Shadow, in which cinematographers share their personal perspectives on what they do and what it means to them. Rick Cruz (BA ’89) designs and mass produces guitar amplifiers under Cruz Amplification. His amplifiers are used by Cheap Trick, John Fogerty, Jim Peterik and The Ides of March. He also owns and operates a recording studio in Chicago. Patrick Egan (’86) self-published his first novel, Get Happy. It is available in paperback and as a digital download for Kindle and Nook. Donald Fox (BA ’85) is working as a master control operator at Weigel Broadcasting, the home of Me-TV and Movies! as well as many other channels. Laura Good (BA ’89) released her fifth CD with alternative pop band The Twigs. Jump Right In, from Whirligig Records, features songs for kids of all ages. Corey Hall (BA ’88) published the sixth volume of Expressions From Englewood, which features personal essays, poetry, fiction and research from people who live, work or go to school in the Englewood neighborhood of Chicago. Hall was also featured in NewCity’s “Lit50: Who Really Books in Chicago?” for Expressions From Englewood. Brian Kalata (BA ’87) completed his seventh season as key assistant location manager for the Showtime series Californication. He’s turned his attention to his production company, Lucky Coffee Productions, whose first feature project is the documentary Which Side Are You On?, a look at the polarizing issue of labor unions focusing on the historic 2007–08 Writer’s Guild of America strike. Visit luckycoffee prod.com. Mark Protosevich (BA ’83) wrote and co-produced the Spike Lee film Oldboy, which opened in theaters in November 2013. Serita Stevens (BA ’81) was a judge for the 3 Gates of the Dead filmmaking competition. Marlon West (BA ’85) was the effects supervisor for Disney Pictures’ Frozen, which received the 2014 Academy Award for Best Animated Feature. Caryn Capotosto (BA ’99) was associate producer on the documentary 20 Feet from Stardom, which received the 2014 Academy Award for Best Documentary Feature. The film focuses on backup singers for legendary acts such as the Rolling Stones, Bette Midler and Bruce Springsteen. Laura Cooper (BA ’92) is a DJ and the owner of A Special Day DJ and an actor with SAG-AFTRA. Elizabeth Field (BA ’93) was hired as communications manager for the Department of Performing and Media Arts at Cornell University. Jeff Gatesman (’92) was the cinematographer for No Ordinary Hero, featuring Oscar winner Marlee Matlin and Peter Hulne (BA ’91). No Ordinary Hero is a family drama about a deaf actor who plays a superhero on TV, but must look beyond the cape to inspire a deaf boy to believe in himself. The film was chosen for the Heartland Film Festival. Dan Gorski (BA ’98) launched his comedy web series Baby Time!, shot entirely on location in Chicago using local cast and crew, including several Columbia alumni. The series follows a man as he struggles to get across the city and back to his wife before she gives birth. Watch the series at babytimeseries.com. R. Earl Harville (BA ’97) is a member of the Education Board of International Voice Teachers of Mix. Sheila House (’99) was nominated for an Emmy in the 2013 Los Angeles-area Emmy awards for her work producing a PSA for the Santa Monica History Museum. She also received her MS in Entertainment Business from Full Sail University. Kevin Leadingham (’98) is the executive producer of Animal Planet’s Treehouse Masters. The series, which follows host Pete Nelson and his team as they build custom treehouses, has been picked up for a second season. Eric Matthies (BA ’92) completed the documentary feature Killing the Messenger: The Deadly Cost of News, available online at killingthemessengerfilm.com. The trailer was edited at Buddha Jones Trailers with the guidance of Daniel Asma (BA ’92). Chris McKay (BA ’91) was the editor and animation co-director for The LEGO Movie, and David Tuber (BA ’05) was the storyboard artist. Nobuko Oyabu (BA ’95) was featured in Sankei Newspaper, a financial daily newspaper in Japan. The article considers the importance of having a sexual assault victim support system in Japanese society. Stacie Passon (’93) wrote and directed the film Concussion, which is nominated for an Independent Spirit Award in the category of Best First Feature. Concussion premiered at the 2013 Sundance Film Festival. Cherie Richardson (MA ’99) was named senior associate director of development for the Medill School of Journalism, Media, Integrated Marketing Communications at Northwestern University. Previously, she served as a director of development at Bradley University. Klahr Thorsen (BA ’91) has been selected as an International Acting Fellow at Shakespeare’s Globe Theatre in London. The fellowship brings together 20 professional actors from across the world to learn the artistic methods used at the Globe and experience performing in the historic theatre. On the set of the CBS drama The Mentalist, crew members recently discovered they had something special in common: their alma mater. 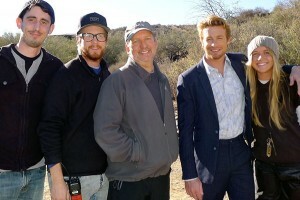 From left to right: Matt Gossen (BA ’10), Zach Andrews (BA ’07), cinematographer Jeffrey Jur (BA ’77), The Mentalist star Simon Baker and Bridget Arnet (BA ’12). Alumni Weekend 2013: Dozens of students and alumni came out for the 3rd Annual Alumni 5K Scholarship FUNd Run/Walk, with proceeds benefiting the Alumni Scholarship Fund and the Columbia Cares: Alumni for Students Fund. 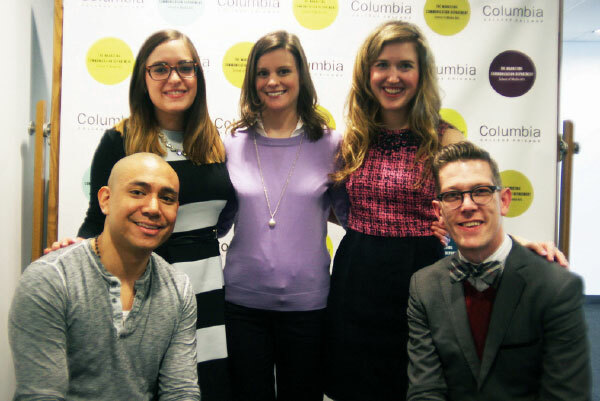 In March, Roland Cailles (BA ’08), Ashley Lavore (BA ’13), Liz Dunlop (BA ’09), Kate Jacobsen (BA ’11) and Ryan Beshel (’07) presented at the Public Relations Student Society of America conference. Steven Berger (BA ’06) produced the film The Pretty One, a 2011 Black List Script that premiered at the 2013 Tribeca Film Festival and was bought by Sony Pictures for a theatrical release. Beth Caucci (MFA ’08) composed music for the popular comedy This Is the End. Her other projects include The Lorax, Free Birds and Ice Age: Continental Drift. Jayson Cruthers (BA ’02) was the cinematographer on the film Coldwater, which was nominated for Best Cinematography at the Las Vegas Film Festival and won the Grand Jury Prize for Best Film. Brant Daugherty (BA ’08) was a contestant on season 17 of ABC’s Dancing with the Stars. He is known for his roles in Pretty Little Liars, Army Wives and Days of Our Lives. 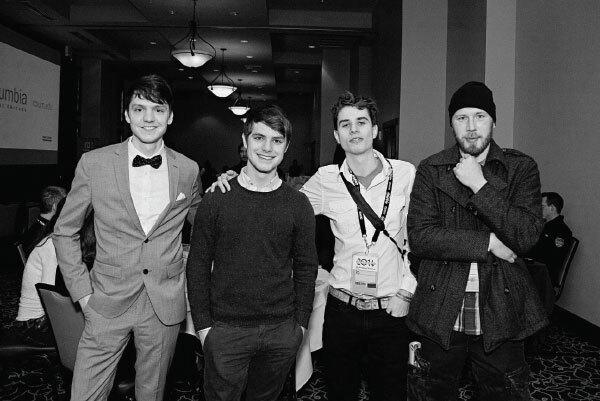 Lucas Graham (BA ’06) shot the 2013 Sundance Film Festival movie Escape From Tomorrow, which opened in theaters and got a Video-on-Demand launch in October 2013. Bryan Grant (BA ’02), owner of Bryan Grant Studios, has been selected by illusionist David Copperfield to brand a new production company, Red Safe, under which Copperfield will develop, create and film television shows. Visit bryangrantstudios.com. Michelle Harmon (MFA ’06) was recently accepted into the Art Director’s Guild and worked as assistant art director on the Emmy-nominated series American Horror Story: Coven. Angela Hobbs (BA ’04) authored the thriller novel Isle of Beasts, available for digital download and in paperback on Amazon. The book received a five-star rating on goodreads.com. Daniel Kibblesmith (BA ’05) co-authored How To Win at Everything, available from Chronicle Books. Jessica Kronika (BFA ’09) is a marketing coordinator at Mid-America Tile. Also, in August 2013, her works in watercolor, ink and pencil en plein air landscape and wildlife subjects were displayed at the “Art in Nature” Exhibit at the Crabtree Nature Center in Barrington, Ill. Visit flyngypsyarts.com. Angela LaRocca (BA ’08) played the lead role in the film The Right Kind of Wrong, which premiered in St. Louis in February. Her one-woman comedy show, Undercover Undergrad, was accepted into a theatre festival in NYC, and LaRocca will perform it in Chicago this year. Frank McGrath (’04) has worked as an editor and assistant editor on several comedy television shows, including Childrens Hospital, NTSF: SD: SUV, Newsreaders and Party Down. Marc Morgan (BA ’07) starred in the film Mordy to the Max, which screened as an official selection at the East Lansing Film Festival and won a Silver Bulb Award at the Vegas Indie Film Festival. Michael Oberholtzer (BA ’05) was cast in the film Delivery Man, which opened in November 2013 and starred Vince Vaughn and Chris Pratt. Laurel Parker’s (MFA ’00) music video for the Emmy-nominated group Gangstagrass has been accepted into the Bang! Short Film Festival in England. Nicholas Pinto’s (BA ’07) photojournalism is featured on the Leica Camera Blog at blog.leica-camera.com. Also visit nicholaspinto.com. Christopher Roach (BA ’01) wrote the film Non-Stop, starring Julianne Moore, Liam Neeson and Michelle Dockery. The film opened on Feb. 28. Hannah Rosner (BA ’09) premiered her directorial debut, Park City, at the United Film Festival at the Laugh Factory in Chicago in November 2013. Charles Sato (BA ’03) is the post-production supervisor for NBC News Peacock Productions. His work has included long-form specials for The Rachel Maddow Show, Hardball and All in With Chris Hayes, as well as reunion specials for Breaking Amish and Sister Wives,network specials for America’s Got Talent and Christmas at the White House, and Weather Channel breaking news specials. Nicholas Sheptak (BA ’05) won a Bronze Key Art Award in the Copy Writing category for his work on the trailer for Anchorman 2. Melodie Simond’s (BA ’06) short film A Friend at the End screened in September 2013 in Long Beach, Calif. Two other Columbia alumni worked on it: Richard Skrip (BA ’06), editor, and Daniel Z. Levin (BA ’06), sound. Daniel Smukalla (BA ’08) is moving into post production on his documentary Sedae, about how various generations in South Korea have been affected by rapid economic growth. Visit sedaechai.com. Michael Stahl-David (BA ’05) starred opposite Sarah Jessica Parker in the off-Broadway play The Commons of Pensacola. Deborah Stokes (MA ’00), curator for education at the Smithsonian’s National Museum of African Art, received the Pioneer Award from the Federal Government Distance Learning Association. Emily Stroble (BA ’09) served as supervising producer for the series Family Travel with Colleen Kelly, which premiered on American Public Television in October 2013. Daniel Vlasaty (BA ’09) published his novella The Church of TV as God through Eraserhead Press. Lena Waithe (BA ’06) produced the film Dear White People, which was selected to premiere at the 2014 Sundance Film Festival in the U.S. Dramatic Competition category and took home the Special Jury Prize for Breakthrough Talent. Yvette Wren (BA ’06) co-wrote an episode of Love That Girl! that aired on TVone on Friday nights in fall 2013. Sundance fever: TV and film alumni descended upon Park City, Utah, to participate in the Sundance Film Festival in January. Top: Will Johnson (BA ’12), Bret Hamilton (’15), Ryan Nanni (BA ’12) and Jon Steinhorst (MFA ’09) attended the Chicago Luncheon and Alumni Film Screening on Jan. 18. In March, alumni screened their feature film Animals at the South by Southwest festival in Austin, Texas. 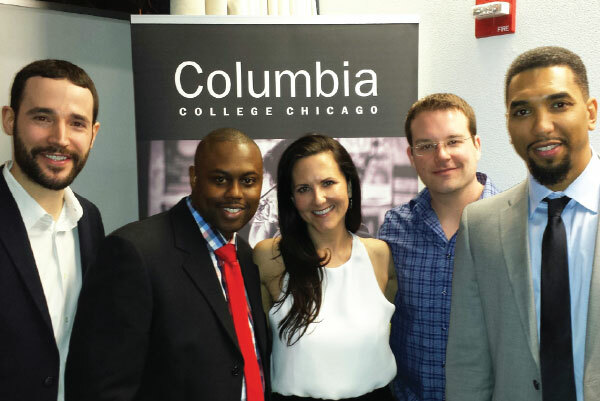 From left to right: Chris Charles (BA ‘07), executive producer; Charles Young, co-producer; Mary Pat Bentel (BA ‘01), producer; John W. Bosher (BA ‘06), executive producer; and Damon L. Marks, co-producer. Michael Bailey (BA ’12) made his theatrical debut in Paramount Theatre’s production of Miss Saigon as part of the 2013–14 Broadway season. Directed by Jim Corti and choreographed by Columbia College Dance Department staff member Jeff Hancock, the show ran Oct. 30–Nov. 24, 2013. 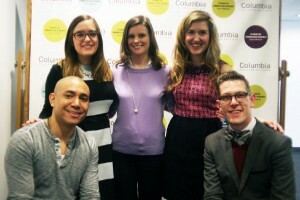 Samantha Crowley (BA ’11) was recently a post-production assistant on the show Lucky 7 for ABC. Quiana Edmond (BA ’12) was admitted to the Indiana University Kelley School of Business, where she will earn her MBA in strategic management. Joel Everett (BM ’10) has been nominated for a regional Emmy Award in the area of Music Composer/Arranger for his score to the historical documentary Merger: Making the Twin City by WSTV. Agnes Hamerlik (BA ’12) was approached to be part of the FLOR flooring catalog after part-time Photography faculty member Sarah Faust learned about her fashion designs through DEMO magazine (Spring/Summer 2013). Christina Harper (BA ’12) was featured in the show The Story of Curtis Mayfield, which ran through March 30 at the Black Ensemble Theatre in Chicago. Sarah Levi (MAM ’10), a board member for Artlink Phoenix, opened art gallery Tabula Rasa Collective, focused on Arizona artists, in the downtown Phoenix arts district. Visit tabularasacollective.com. Diane Mayers-Jones (BFA ’10) was one of the entrepreneurs featured in an exhibit called “Our Work: Modern Jobs, Ancient Origins” at the Oriental Institute of the University of Chicago. Jacqueline Rezak (BA ’10) is a designer for the clothing brand Rad and Refined. Her garments have been worn by the likes of Miley Cyrus and Tegan and Sara. Chris Terry’s (MFA ’12) novel Zero Fade was a Favorite Book of 2013 for Slate.com, was named one of the Best Teen Books of 2013 by Kirkus Reviews and has been nominated for the Young Adult Library Services Association’s 2014 Best Fiction for Young Adults list.